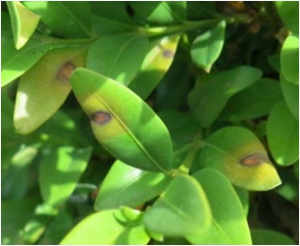 Boxwood blight is a relatively new and threatening boxwood disease caused by the fungus Calonectria pseudonaviculata. Boxwood Blight was first detected in North Carolina in 2011 and has recently been confirmed in the Highlands area of Macon County and in home landscapes in Transylvania, Jackson, and Forsyth Counties. Common names of this disease include: Boxwood Blight, Box Blight, Cylindrocladium Box Blight, Blight Disease of Boxwood and Boxwood Leafdrop. 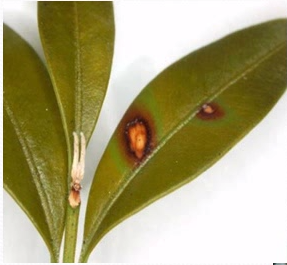 Landscapers, homeowners, nurseries, and garden centers should be alert for symptoms of Boxwood Blight which include brown leaf spots, black streaks on green twigs, and leaf drop that may begin in the lower portions of the plant. 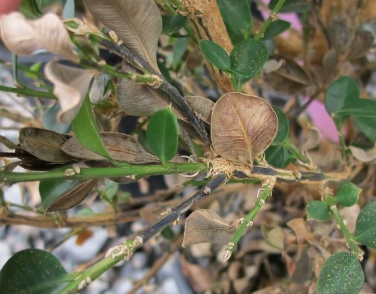 Symptoms – Boxwood Blight results in severe leaf drop and decline of susceptible boxwoods. Symptoms include: dark or light brown circular leaf spots often with darker margins; straw to bronze colored blighted foliage; dark cankers or black streaks on stems; and leaf drop. Disease development, blighting and defoliation can occur swiftly with complete leaf loss under warm (64 to 80°F), humid and shady conditions. Even after severe defoliation, root systems of boxwood blight infected plants remain healthy and intact, unlike roots infected with Phytophthora. Oftentimes, when boxwood blight is in advanced stages, symptoms mimic and can be confused with damage caused by nematodes, Volutella blight or the root rot disease Phytophthora cinnamoni. Transmission – Boxwood Blight is not carried in by wind, but instead by the movement of infected plant material such as contaminated container or field-grown boxwoods or boxwood greenery used for rooting cuttings or for holiday decoration. Boxwood Blight spores can also spread via pruning tools, clothing, equipment and anything that might have contacted infected plants e.g., workers, animals and a few bird species such as geese and ducks. Do I have Boxwood Blight and What to do? – First contact your local County NCSU Extension Agent to determine if you have boxwood blight. Symptoms showing boxwood decline occur more readily from nematodes and P. cinnamoni and so it is important to identify the proper pest with the NCSU Plant Disease and Insect Clinic. If verified, Boxwood Blight cannot be effectively controlled once the infection begins. Fungicides such as Daconil (Chlorothalonil) act preventatively but lack in any curative effects. Prompt removal of any dis­eased boxwoods and leaf debris is recommended to help prevent future spread to healthy shrubs. If you intend to replant with more boxwoods, please note that boxwood blight produces long-lived survival structures that can persist in the soil for approximately 6 years. These sur­vival structures can re-infect susceptible replacement box­wood cultivars in locations where the disease has been diagnosed. Therefore, replanting susceptible boxwood cultivars or members of the Buxaceae family in a loca­tion where infected boxwoods have been removed is not desirable. Boxwood cultivars with limited resistance to the disease are available but will act as a host of the disease and can infect neighboring susceptible boxwood cultivars. Fungicides cannot eradicate the disease from infected plants. Once Boxwood Blight is present in the landscape, it is very difficult to control. Fungicide applications started after the disease is present will not provide disease control, according to the latest research results from North Carolina State University. Fungicides labeled for use by homeowners are protectant fungicides and must be used preventatively. An effective preventative fungicide spray program will require repeated applications (at 7-14 day intervals, depending on product label and environmental conditions) of fungicides throughout the season. Warm temperatures with leaf wetness results in high boxwood blight disease pressure, so if temperatures are near 60°F and a rain event is expected, a preventative fungicide spray should be in place. Thorough fungicide coverage of boxwood foliage is difficult, yet necessary for protection from the disease. Purchase boxwood from nurseries free of Boxwood Blight. Minimize leaf wetness and promote good air-circulation in boxwood plantings to minimize disease pressure. Ensure good air circulation in plantings by providing adequate spacing between plants. Mulch boxwood plantings to reduce the spread of Boxwood Blight inoculum to foliage by splashing water. Avoid working in boxwood plantings when the foliage is wet and fungal inoculum is more likely to be spread. Practice good sanitation to avoid moving infected soil or plant material to landscapes with boxwoods. Sanitize tools, equipment, clothing and tarps when moving between boxwood plantings. Bag and dispose of all boxwood debris (including holiday greenery) in the landfill or bury 2’ deep in soil away from boxwood plantings. If you have boxwoods in your landscape, discuss Boxwood Blight with hired landscape professionals to learn about management practices they have in place to avoid movement of Boxwood Blight from one client’s landscape to another. • Randolph G. Gardner, Ph.D.